First Lady Michelle Obama is headed to Wisconsin and Illinois Wednesday in what is the beginning of an eight state, two-week campaign tour on behalf of embattled Democrats. As is often the case with first ladies, Mrs. Obama is far more popular than her president husband. The White House has acknowledged that she has been one of the most frequently requested surrogates by Democratic candidates across the country. Mrs. Obama will not play the role of attack dog against the Republicans. Instead, she will attempt to personalize and humanize the impact of her husband’s policies and his administration’s accomplishments to date. 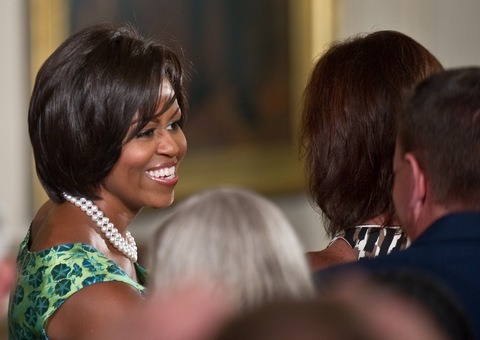 Christi Parsons of the Chicago Tribune got a sneak peek at Mrs. Obama’s planned remarks. The first lady heads to Wisconsin to campaign with Sen. Russ Feingold who finds himself in the toughest reelection battle of his career against Republican Ron Johnson. She then heads home to Chicago where she will campaign on behalf of the Democrat seeking her husband’s old Senate seat, Alexi Giannoulias. Mrs. Obama will also dabble in House politics. She will help raise money for vulnerable Democratic incumbents Rep. Debbie Halvorson, D-Ill., and Rep. Bill Foster, D-Ill. And she will get to play a bit of offense by helping out Dan Seals, the Democrat seeking to pickup the seat Republican Mark Kirk is vacating to run for Senate. The Kirk seat is one of four likely pickup opportunities for Democrats in a year where it has been mostly defending tough turf for the majority party. Over the course of the next two weeks, Mrs. Obama will campaign in Colorado, Washington, California, New York, and Connecticut. On Sunday, she will appear side by side with her husband in Columbus, Ohio, at their first joint campaign rally since 2008. A new poll shows the U.S. Senate race in Alaska is a dead heat between and Sen. Lisa Murkowski and the Republican nominee, attorney Joe Miller. Public Policy Polling performed the survey, released Tuesday, for the liberal-leaning blog Daily Kos. It found Miller had 35 percent support while Murkowski drew 33 percent, inside the poll’s 2.4 percent margin of error. The Democratic nominee, Scott McAdams, received 26 percent. Unlike last month’s CNN/Time survey that had Miller narrowly leading Murkowski 38 to 36 percent, the PPP poll did not offer Murkowski as a choice to respondents right away. Instead, it asked people if they would vote for Miller, McAdams or someone else. More than a third chose someone else and 95 percent of them went on to say they preferred Murkowski to two little-known independent candidates and the Libertarian Party’s nominee. While write-in campaigns are traditionally difficult to measure, this result indicates Alaska voters are willing to put forward the extra effort required to select Murkowski. The poll also sheds light on how Murkowski has managed to remain competitive. The incumbent wins 31 percent of Republicans, 38 percent of independents and 25 percent of Democrats. The survey came a day after Miller told reporters he would not answer any more questions about personal issues for the rest of the campaign, contending he had been mistreated by the news media in Alaska. That move did not sit well with the Alaska Daily News editorial board. “Joe Miller is free not to answer any questions. But the media and Alaskans are free to keep asking them — and digging for answers,” wrote the board. With 20 days until Election Day, national Democrats are being forced to make some tough decisions on where to allocate resources. Jeremy Jacobs of Hotline On Call reported Tuesday that the Democratic Congressional Campaign Committee canceled ad buys in six districts. They include three open seats previously held by Democrats – Indiana’s 8th, Tennessee’s 8th and Kansas’ 3rd – as well as three seats with Democratic incumbents – Pennsylvania Rep. Kathy Dahlkemper, Florida Rep. Suzanne Kosmas and Ohio Rep. Steve Driehaus. In another four districts, the DCCC has reduced the size of its ad buys but still has reservations made through Election Day. These adjustments are in districts where Democrats have been running behind, but are still within striking distance of their Republican opponents. And in two more districts, the DCCC has cancelled ad reservations from a position of strength; their candidates are running well ahead of Republican nominees. Taken together, the ad buy movement shows the DCCC is making its final adjustments to its TV strategy. The DCCC is taking the money and investing it in races where it believes it has a better shot of winning in November. In their final debate, former eBay CEO and Republican gubernatorial candidate Meg Whitman verbally jousted with state attorney general and former Democratic governor Jerry Brown. “It’s unfortunate. I’m sorry it happened. I apologize,”â€¨ Brown said.